Chad Smith plays drums for worldwide super group the Red Hot Chili Peppers. His awesome rock snare drum looks as good as it sounds, and consistently produces one of the best overall rock drum sounds in the world today. Few drummers today are both as outrageous and as dedicated to the art of drumming as Chad Smith. His signature sound is consistently one of the best overall rock drum sounds today. Chad's Signature Series Snare Drum reflects his outrageousness, his dedication to perfection, and offers an awesome rock snare sound. 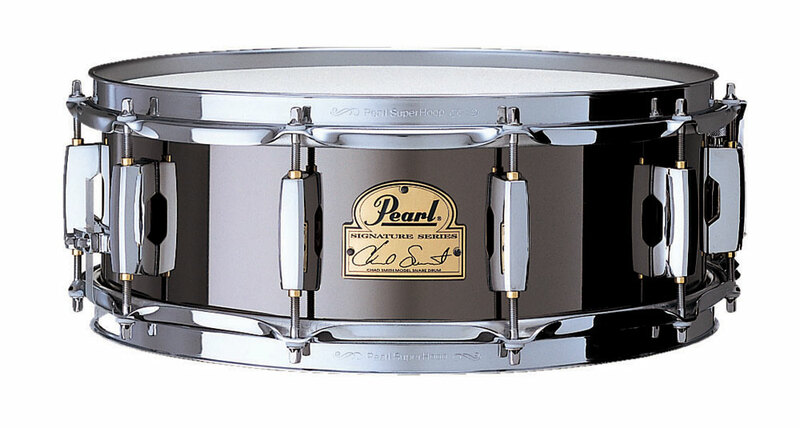 This drum is one of the most sensitive snare drums we offer. Its sound is very bright and articulate with great body; a very smooth frequency response and a wide tuning range. Our Chad Smith Signature Snare Drum looks as good as it sounds offering an exclusive 14"x 5" black nickel plated steel shell, our CL-55 "Bridge Style" minimum contact lugs, 2.3mm SuperHoop II's, our "Gladstone Style" Vertical Pull Throw-Off, and precision-fit Stainless Steel tension rods and solid brass receives for super precise tuning.